If you want to know what’s ahead for the luxury market, look no further than Paris, France. In 2017 real-estate research firm Savills named Paris the capital of luxury retail after it experienced the most luxury retail store openings in the world. But look at Paris today. It is a battleground with yellow-vested protestors in the streets. While officials claim the protests are losing momentum due to the cold weather, the weekend of December 15 was a replay of the last five weekends. Police had to fire tear gas and use water cannons to disperse the Yellow-Vest crowds on the Champs Élysées. Next year it is unlikely that other luxury centers will erupt with such violent demonstrations as has Paris. But the luxury market will become a battleground nonetheless in 2019. The primary battle lines in luxury will be market turbulence and competitors struggling for a shrinking share of consumer spending, even while the ranks of the wealthy rise. Also in 2019 luxury brands will be challenged to focus on the human aspect of the digital revolution, as they seek to find traction with the younger, digitally-powered consumers that have come with it. At the end of December the Savigny Luxury Index, compiled on the stock values of 18 leading luxury companies, ended the month virtually where it started, which was down at the end of November at levels lower than at the beginning of the year. During December, only two companies stock prices rose — Richemont and LVMH. Two others were flat — Hermes and Luxottica — and the rest declined. Among the biggest underperformers in December were U.S. stocks, due to “uncertainty at home,” Savigny reports, noting that Tiffany, Tapestry and Capri Holdings (formerly Kors) all lost more than 10% of their value in December. Goldman Sachs concurs and dropped its 2019 forecast for luxury industry sales growth from a previous 7% to 5%. The investment community dislikes any uncertainty and there is plenty of it to go around. A recent survey by J.P. Morgan among ultra-high-net-worth investors (those with more than $30 million in liquid financial assets) found that 75% expect a recession to hit the U.S. by 2020. Even Gucci CEO Marco Bizzarri, who sits on top of the world’s fastest-growing legacy luxury brand, knows the good times can’t last. “We need to recognize the fact that at a certain point we’re going to slow down, we cannot keep on growing 50-60% per month, it’s impossible,” he said in a video to company employees. Capgemini, in its World Wealth Report 2018, reported global high-net-worth-individual wealth rose 10.6% in 2017 to surpass $70 trillion, the first time it has reached this level and following six consecutive years of wealth gains. Capgemini defines the HNWI as those with investible assets of $1 million or more, excluding primary residence, collectibles, consumables and consumer durables. At its present rate, global HNWI wealth may top $100 trillion by 2025.
Credit Suisse takes a more inclusive look at the wealthy, including the value of one’s primary residence and the other things that Capgemini excludes. According to its calculation, the number of millionaires reached 42.2 million worldwide in 2018. The U.S. has the heaviest concentration of millionaires by far, with some 41% of the world’s millionaires or 17.4 million of them living in the U.S. That is almost as many millionaires as live in the next largest nine countries combined. China has but 3.5 million millionaires, Japan 2.8 million and the U.K. 2.4 million, these three being the next most prosperous countries. But cultural tides are turning against the wealthy elite. Where wealth used to be something the affluent wore proudly, today the wealthy are retreating into their cocoons, living behind walls and going increasingly inconspicuous. As the rich get richer, everybody else has fallen behind. Income inequality is causing resentment to grow among the hoi polloi and anxiety to rise among the wealthy. The result can be catastrophic, as we see in France. One of the flash points in the Yellow-Vest protests is President Emmanuel Macron’s repel of the French wealth tax imposed on households with assets valued at €1.3 million or more. The back lash against the wealthy elite has had immediate impacts on luxury sales, that are likely to persist through 2019 with not just the wealthy Chinese but other well-heeled tourists avoiding the country. 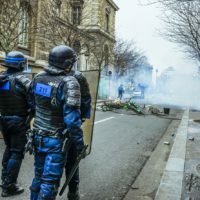 The French Finance Minister Bruno Le Maire estimated Paris has experienced a sales decline between 20%-40% as a result of the protests. And it’s not just Paris luxury boutiques and department stores that are feeling the pain. The French Fevad E-Commerce Federation reports that online retailers’ sales are flat year-over-year for the first nine days of December. Consumers don’t like uncertainty anymore than investors. It isn’t only fear of physical violence that is keeping French citizens from shopping. It is psychological anxiety about what comes next. What is happening in France is but a bellwether of things to come worldwide as the wealthy grow more anxious and in response become less conspicuous, retreat from danger in the public square and act to secure their holdings. The watchwords for the wealthy in 2019 will be privacy and security. This will only make it harder for luxury brands to connect with them in the coming year. Why? Because that is where the growth is. Euromonitor International reports that luxury goods sales are growing nearly three-times faster online than in physical retail, 14% as compared with traditional retail at 5%. Digital disrupters got an early leg up on the digital revolution, as luxury brands were slow to commit or not convinced that their customers wanted to interact digitally. This also made for strange partnerships. Not long after Richemont acquired digitally-native multi-brand platform Net-a-Porter and combined it with Yoox to form YNAP, which also provided e-commerce operations for seven of its chief competitor Kering’s brands, Kering announced it was ending its YNAP operations partnership to develop its own online capability by 2020. When it was announced, YNAP said, “This transition is a natural evolution for a large group with the scale of Kering,” and pointed to the fact that Kering was already running e-commerce operations in house for Gucci, its largest brand. But YNAP also operates online flagship stores for 26 other competing luxury brands, like Alaia, Balmain and Ferrari. Even as YNAP remains committed to managing each online store independently and offers bespoke technology solutions for each, other big players may look to bring e-commerce operations back inside. All the while, Richemont through YNAP continues to support sales of Kering and many other luxury brands across its multi-brand online luxury retail platforms, including Net-a-Porter, Mr Porter, Yoox and Outnet. Farfetch, a digital fashion marketplace that offers selections from nearly 900 fashion boutiques and brands worldwide, has similar partnerships with Burberry and Chanel, although Chanel is using Farfetch-supplied technology in its stores, not to sell online. Last year, LVMH, parent of Louis Vuitton, launched its own multi-brand website known as 24 Sevres. It also maintains individual websites for its House brands. But as luxury brands have all eyes on technology, they’ve been slower to adapt to the human side of the digital revolution. Using catch phrases like omni-channel or channel agnostic, most organizations still run digital operations behind locked doors. That is because the technologists remain the experts on translating the brand’s DNA into computer code. SAP’s Lori Mitchell-Keller explained a major hurdle for luxury brands is to maintain the perceived “cache of luxury in the online world.” But the digital revolution also calls on them to enhance the human experience, as it is humans after all who have to interact with the brands either digitally or physically in order to make a purchase. Programming the human dimension into luxury brands’ digital and in-store systems will require managers with skill sets acquired from anthropology or sociology, not necessarily in the computer science lab or the retail management track. Then there is the continued digital disruption coming to advertising and marketing that supports luxury brands in their mission. The winners next year will be digital advertising platforms; the losers will be print publications. For example, Calvin Klein just announced it will pull all advertising from print media starting in February 2019 in favor of a “digital-first, socially-amplified model.” While it is not expected that other luxury brands will make such an all-or-nothing move, rest assured that luxury brands will pick up the pace at which they pull money out of print and shift it to digital next year. UK-based Zenith’s 2019 Advertising Expenditure Forecastsreports that digital spending will be responsible for all growth in luxury advertising spending.“We forecast luxury advertising in digital media to grow by US $886m between 2017 and 2019,” it reports, and adds that digital will account for about 33% of luxury’s total advertising budgets. In order to grow luxury brands need new customers and today that means millennials. The generation’s sheer size, reputed to be as large if not larger than the baby boom generation, offers luxury brands a 20+ year supply of new customers. Looking across this vast generational cohort, defined by Pew as 73 million strong in 2019 and born between 1981 and 1996, there is one segment in that cohort that is most important for luxury brands: the HENRYs (high-earners-not-rich-yet). With higher incomes relative to the majority of the population, between $100k and $250k in the U.S., HENRYs hold the space above the bottom 75th percentile but below the top 95th percentile, where luxury brand’s traditional ultra-affluent customers are found. Since true affluence comes with age, the millennials aged 23-to-38 in 2019 are only now beginning to hit their stride in terms of income and wealth. Compared with the rest of the millennial generation, the young HENRYs are better educated, more informed and set the trends that their lower-earning peers will emulate. And even more important for the long-term prospects of legacy luxury brands, most people who reach ultra-affluent levels of income start out as HENRYs. These are the customers that luxury brands need to identify now in order to nurture for future growth. Complicating matters for luxury brands is the fact that HENRY millennials approach the luxury market with new ideas about what luxury is, what it means to them and how they want to participate in it. A recent Ipsos study found that 81% of modern luxury consumers believe the definition of luxury is rapidly changing, a fact that should be abundantly clear to luxury brands. HENRYs’ new ideas about luxury will require fundamental shifts in what luxury brands sell and how they sell it. Gucci is on it, but other luxury brands may remain entrenched in their more traditional ideas of luxury. First and foremost millennial HENRYs place a higher value on experiences than tangible luxury goods. “There is a fundamental shift in consumer values towards luxury experiences over things that bring happiness and well-being,” reports Euromonitor, citing a survey among millennials which found over 50% of U.S. millennials prefer to spend money on experiences over things. That means the concept of a luxury good as a status symbol is rapidly being replaced by that of a status experience or an Instagram-worthy moment. Millennial HENRYs want to start checking off the boxes on their bucket list by age 40, not wait till their 70. Turning to their material goods’ needs, millennial HENRYs are the most empowered generation ever and thanks to technology, they have access to most of the products the world has to offer at their fingertips. They are also far more educated and informed consumers than any generation before and are able to suss out the relative value of their purchases to make decisions right for them. Increasingly traditional luxury goods are not making the cut, as HENRYs opt for lower-priced but still premium options from brands like Everlane, Gilt, Outnet.com (the outlet site for full-priced Net-a-Porter), membership sites like RuLaLa, as well as Neiman Marcus’ Last Call, Nordstrom’s Rack and Saks Off 5th Avenue. With experiences their focus, millennial HENRYs are also choosing access to luxury over ownership of it, giving rise to the gently-used luxury market and the rental model, from Rent the Runway, The RealReal, Zipcar, AirBnB and Uber that don’t weigh them down with the high cost of ownership and maintenance. Luxury brands are going to feel the conflicting push-pull from their traditional wealthy and older customers who want one type of luxury and their younger, less financially-endowed customers and potential customers who want a totally different kind of luxury. Luxury’s present fortunes hang on the one, and their future depends on the other. Luxury brands will face a complicated balancing act in 2019 and beyond as they are forced to navigate potential disruption coming at them from these macro trends. Not all will be up for the challenge.